It's a lot to manage and to keep organized! 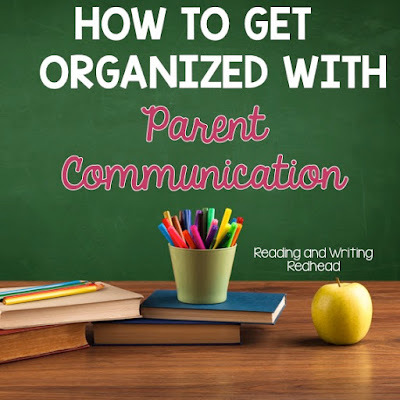 I was recently talking with a colleague and she wanted to know how I organize my parent communication and while I was talking about it with her, I thought I should share what I do on the blog, too! We all use email on a daily basis! But did you know you may be able to schedule some emails in advance, which is a great way to get organized? This depends on your email provider. For Gmail, you can get an add-on or extension such as Boomerang that allows just that. Usually there is a certain amount of messages you can schedule out in advance (Boomerang has 10 free messages a month). I usually schedule out emails in advance for things that occur regularly or for reminding parents about upcoming events, such as reminders about due dates for book orders or monthly school spirit days. Also, you can save frequent or recurring emails* in a special folder inside your email. I call mine "templates". What is in there? Things like emails about the Halloween parade, which are pretty much the same every year. When it's that time again, I go in, copy it, paste it in a new email, and edit for anything that has changed, like the exact date, etc. Don't just hit forward on the email - you want to make it look as if you have taken the time to write a fresh message to parents. *I find mine in the sent folder after I have sent them and the hit the check box and move them to my new/special folder for future use. Remind.com - I imagine there are other similar websites/tools, but I use remind.com. Remind is a service that allows teachers to text parents (and students if you teach older students) without sharing your personal phone number. It's safe, secure and easy and reminders can be sent right away or scheduled out in advance. I find they have a much higher read rate then my blog. I wish I could get stats on email opens but I'd guess that the amount of messages read on people's phones via Remind is much higher than email. Do you have a classroom blog? When my school first asked us to start classroom blogs, one thing I did was look through my paper notices that I kept in a binder, and I typed them out for use in emails and on my blog. Easy and a good place to start if you are new to having a classroom blog. Another tip is that you may be able to schedule your blog posts in advance, as I can with my classroom blog. This is great if you know you have certain posts that you want to go out, such as at the beginning of the year when there is quite a lot of information to share with parents. Get organized and get it on your blog and schedule it out in advance! Also, if you have recurring blog posts, such as those back to school blog posts, there is no reason to retype the whole thing. For example, in Blogger, you can go in to your post listings, find the previous post, copy the text and paste into a new post! Just make sure, like with repeating past emails, you double check everything and edit for details such as dates! To make new parents more comfortable with you as their child's new teacher, consider an all about me parent brochure. I got a terrific editable one from Teachers Pay Teachers and if you want to know the exact one, just ask and I will look it up! Here's an image of the one I did last year! So, how do you stay organized with your parent communication? Let me know!